A powerful antiwar film about two siblings who face despair as the war and their lives come to an end. Grave of the Fireflies by Isao Takahata is a historical fiction war animation which succeeds at eliciting emotions from its viewers. The animation is stunning and forces its viewer to reflect on the importance of family and the non-combatant victims of war. Grave of the Fireflies was originally made in 1988. It is a coming of age story due to necessity of a young boy (approx. 12-14 years-old) that cares for and protects his little sister (approx. 4-6 years-old) in war stricken Japan. Regardless of all the loss, tragedy, and despair due to the horrors of war, this animation tests the love and loyalty of family. The movie begins with the death of a young boy as his spirit which then joins another; a young girl that we come to learn is his sister. The movie flashbacks to their home village that is attacked by fire bombs near the end of WWII. Teenage Seita and his younger sister Setsuko literally run for their lives as they view mass destruction, death, and hysteria. Now homeless and left on their own while their father is away serving in the Imperial Navy, these two find themselves unsure how they will survive and utterly frightened in their newly shattered world. Seita and Setsuko initially stay with their aunt who only adds to their misery as result of her lack of compassion and hatred for the children as their guardian due to the time commitments and financial responsibilities that she’s now been burdened with. Sieta decides that he and his sister will leave, fend for themselves, and make residence in a cave by a stream. Due to their ages and lack of funds, their meager resources are quickly exhausted. Seita resorts to stealing food for the sake of his sister, Setsuko, who eventually still dies from malnutrition and is buried by her brother in an unmarked grave. Sieta, now in the crowded railway station where the movie first began, broken hearted and his spirit broken, he collapses and dies. Grave of the Fireflies is not for the faint of heart, but nonetheless an excellent historical fiction film. This animation is very sad and depressing as the viewer watches the siblings lose their parent, their home, attempt to live independently, the brother’s devotion and sole purpose in life entirely focused on keeping his fragile sister alive while the war still rages and food become more and more scarce. As the two children live on their own in a cave, the viewer will wonder if their hope is that of a child with some innocence still salvageable and not yet stripped from the war, or an impressive sense of hope and will for survival that helps maintain their spirits high regardless of the horrors surrounding them. The viewers will observe that one of their highlights are the nightly fireflies which are symbolic in their dark reality. Interestingly, Takahata combines the present and the past in this late WWII historical fiction animated story with the imagery beginning and ending in the train station. This is very poignant and emotional for the viewer to learn of the event that led to the young boy’s death. Initially knowing that the protagonist dies and then following the preceding events leading to his death suggests that children who, like Seika and Setsuko, die needlessly in wars they neither fought nor understood. The film is unrated and not suitable for young children and should be cautiously chosen if being shown to early tweens due to the violence and emotionally intense material. The message of Grave of the Fireflies is simple; innocent civilians suffer as much as or more than the combatants, and triumphs as it displays the bounds of the human spirit amidst brutal and horrifying experiences. 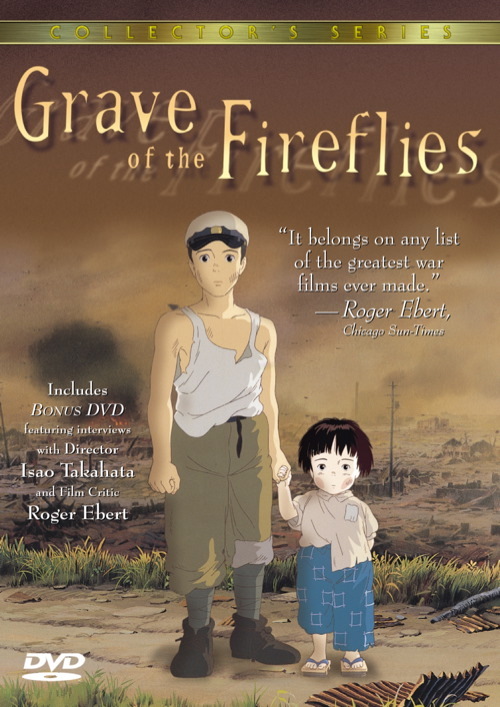 Films such as Grave of the Fireflies may easily be used for WWII related course curriculum. The film was originally produced as a motion picture in Japan in 1988, is based on the novel by Akiyuki Nosaka, and has even been made into a live feature film with the same title. This film is as moving, unforgettable, and emotional as the film The Boy in the Striped Pajamas based off of the book by John Boyne or the novel The Diary of a Young Girl by Anne Frank.